TEAM Industries is a leader in North American continuous variable transmissions (CVT) production; assembling and balancing over half a million CVT assemblies each year. 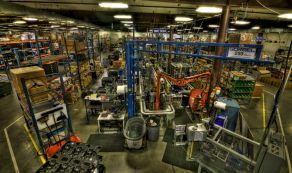 We also assemble hundreds of thousands of transmissions and transaxles, and build a multitude of sub-assemblies, utilizing flexible cellular manufacturing methods that include varying combinations of manual, automated and robotic assembly processes. TEAM has the flexibility and resources to arrange team members, workstations, and/or equipment in sequences that optimize efficiency. In so doing, inventories and materials move continuously and smoothly, from start to finish, producing products in a single process flow. Minimal handling of materials and increased production speeds result in great cost and time savings, reduced inventory and consistent quality.